The Journal Engineering was issued in 1986. It was Stopped from 1990 – 1997 because of the economic blockade. It restarted publication after the fourth scientific engineering conference for it published the papers that were accepted in the conference. It is a scientific engineering journal refereed by specialized and qualified professors in most of the engineering fields and those Specialists in the issued by the college of Engineering university of Baghdad .It was serenely publibued , but from 2011 it has issued of monthly for the numerous papers submitted to the journal to publish their papers in this scientific journal in addition to some of the Arabs professors because the journal is considered one of the valued journals in the Arabic homelan . Many professions were the head editor of the journal from its first issue. The first one was prof.dr. Laith Ismail Namiq then prof.dr. Mohammed A.Alawis ,prof.dr.Ali A Al – kilidar prof.dr. Abdul-Ilah Younis and currently Prof.dr.Qais S. Ismail. 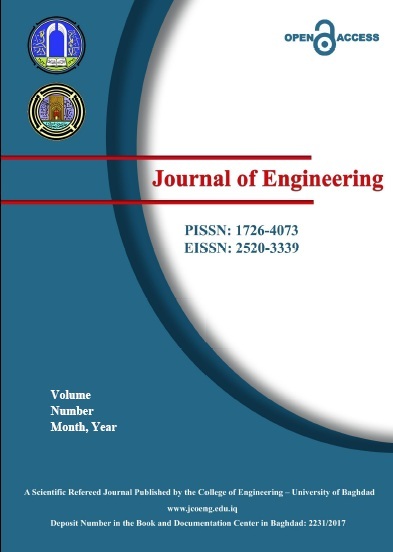 The Journal of Engineering is an open access, monthly, refereed, peer-reviewed journal. It focuses on the different disciplines of engineering. Its scope is to cover almost all the aspects of engineering and technology and their related topics. The Journal of Engineering tries to emphasize on publishing high-quality papers with an acceptable, professional and considerable background. The submitted papers undergo plagiarism, a double-blind peer review by professionals in the paper specific specialty. This process is accomplished according to the Journal criteria of evaluation, where the manuscript, contents, and organization of the paper are to be checked. The papers will be available online for the readers. Al-Si alloys which are widely used in engineering applications due to their outstanding properties can be modified for more enhancements in their properties. Current work investigated the ability of these alloys to be modified by casting them through the addition of nanoparticles. So, Multi-wall carbon nanotubes (CNT) and titanium carbide ceramic particles (TIC) with size of (20 nm) were added with different amounts started from (0.5 up to 3%) weight to cast alloy A356 that was considered to be the base metal matrix, then stirred with different speeds of (270, 800, 1500, 2150) rpm at 520 °C for one minute. The results showed change in microstructure’ shape of the casted alloys from the dendritic to spherical grains with increasing stirring speed. Also, EDX analysis confirmed the existence of CNT and TIC additions over inter-dendritic locations related to the affected area. However, the enhancement in the mechanical properties for both types of castings was gained at a weight of 2.5% and a stirring speed of 1500 rpm. سبائك (Al-Si) لها استخدامات واسعة في التطبيقات الهندسية بسبب خواصها الرائعة والتي ممكن ان تتطور لاجل تعزيز خواصها.العمل الحالي يحقق قابلية هذه السبائك لتطويرها بعملية السباكة من خلال الاضافة للدقائق النانوية.أنابيب الكاربون النانوية وكاربيد التيتانيوم ذات حجم حبيبي (20nm) أضيفت بكميات مختلفة وبنسب تتراوح بين (0.5-3%) لسبيكة الاساس (A356) ، بعدها تم الخلط بسرع مختلفة (2150،1500،800،270 rpm)عند درجة حرارة (520°C) ولمدة دقيقة واحدة.النتائج بينت تغير في شكل البنية المجهرية للسبيكة من الشكل الشجيري الى الشكل الكروي مع الزيادة في سرعة المزج. أيضاً فحص (EDX) أكد وجود المضافات النانوية من أنابيب الكاربون النانوية وكاربيد التيتانيوم داخل المواقع الشجيرية، على اي حال تعزيز الخواص الميكانيكية للسبيكة الاساس المدعمة بالدقائق النانوية من (TiC,CNT) كانت عند نسبة اضافة (2.5%) وعند سرعة خلط (1500rpm). This work presents the modeling of the electrical response of monocrystalline photovoltaic module by using five parameters model based on manufacture data-sheet of a solar module that measured in stander test conditions (STC) at radiation 1000W/m² and cell temperature 25℃. The model takes into account the series and parallel (shunt) resistance of the module. This paper considers the details of Matlab modeling of the solar module by a developed Simulink model using the basic equations, the first approach was to estimate the parameters: photocurrent Iph, saturation current Is, shunt resistance Rsh, series resistance Rs, ideality factor A at stander test condition (STC) by an iteration process. To implement the iteration process, a numerical approach based on the Newton Raphson method has been implemented and programmed in Matlab. The second mathematical model used in Matlab/Simulink using equations for each parameter to determine the parameters at all operating conditions. The Matlab program gives the information about the behavior of the practical PV module, under different atmospheric conditions. The model accuracy was also analyzed through finding out the compatibility between the practical and the theoretical aspects at different solar radiation intensity 500, 750 and 1000 W/m2 by extracting the error ratios. The results show that there is difference between theoretical (modeled) and experimental, the best validation (less error) between five parameters model and experimental maximum power results at radiation 500, 750, 1000 W/m2 and STC was 5.5%, 19%, 18% and 12.3% in January respectively, due to the decreases in ambient temperature and thus decreases in the temperature of solar module in January led to increase in maximum output power and producing best validation between model and experimental in this month. يقدم هذا البحث نمذجة الاستجابة الكهربائية لأداء اللوح الشمسي أحادي البلورة باستخدام نموذج الخمس عوامل يستند إلى بيانات ورقة التصنيع للوح الشمسي المقاسة عند الظروف القياسية. يأخذ النموذج في الاعتبار مقاومة التوالي والتوازي للوح الشمسي ويهتم البحث بنمذجة ماتلاب المفصلة للوحدة الشمسية بواسطة نموذج سيمولينك المتطور الذي يستخدم المعادلات الأساسية،الطريقة الأولى لحساب العوامل: التيار الضوئي، تيار إلاشباع، مقاومة التوازي، مقاومة التوالي, عامل الجودة في حالة الظروف القياسية (الإشعاع 1000 واط/متر مربع ودرجة حرارة الخلية ℃25) من خلال عملية التكرار. لتنفيذ عملية التكرار،تم تطبيق نهج رقمي يستند إلى طريقة نيوتن رافسون وبرمجتها فى Matlabالنموذج الرياضي الثاني المستخدم في ماتلاب / سيمولينك من خلال تكوين المعادلات لكل عامل لايجاد العوامل في جميع الظروف التشغيل. برنامج ماتلاب يعطي المعلومات حول السلوك العملي للوح الكهروضوئي في ظل الظروف الجوية المختلفة. كما تم تحليل دقة النموذج من خلال معرفة التوافق بين العملي والنظري عند شدة الإشعاع الشمسي المختلفة 500,750,1000 واط/مترمربع باستخلاص نسب الخطأ. أظهرت النتائج وجود فرق بين نظري (نموذجي) وتجريبي، أفضل تحقيق للطاقة القصوى بين نموذج الخمس العوامل والنتائج التجريبية في الإشعاع 500, 750, 1000 واط/متر مربع وSTC هي 5.5% و19% و18% و12.3 في كانون الثاني على التوالي, بسبب الأنخفاض في درجة حرارة الجو وبالتالي انخفاض حرارة اللوح الشمسي في كانون الثاني مما يؤدي الي زيادة انتاج الطاقة القصوى وانتاج افضل تحقق بهذا الشهر بين المودل والعملي. photovoltaic module --- simulation --- temperature effect --- اللوح الفوتوفولتائي --- المحاكاة --- تأثير الحرارة. In this paper, an experimental study of the thermal performance for hybrid solar air conditioning system was carried out, to investigate system suitability for the hot climate in Iraq. The system consists of vapor compression unit combined with evacuated tube solar collector and liquid storage tank. A three-way valve was installed after the compressor to control the direction flow of the refrigerant, either to the storage tank or directly to the condenser. The performance parameters were collected by data logger to display and record in the computer by using LabVIEW software. The results show that the average coefficient of performance of hybrid solar air conditioning system (R=1) was about 2.42 to 2.77 and the average power consumption was about 1.1 to 1.12 kW when the ambient temperature was about 34.2 to 39.7 ˚C, while the average coefficient of performance of conventional system (R=0) was about 3.23 and the average power consumption was about 1 kW when the ambient temperature was about 30.8 to 34.3 ˚C. It can be concluded that the use of the hybrid solar system in Iraq with its current form could not be saved electricity.تم إجراء دراسة تجريبية لاختبار الأداء الحراري لنظام تكييف الهواء الشمسي الهجين ورؤية مدى ملائمته للاجواء الحارة في العراق. يتكون النظام من دورة بخار انضغاطية مدمجة مع مجمع شمسي من نوع الانابيب المفرغة بالاضافة الى خزان الماء الحار. تم تركيب صمام ثلاثي الاتجاه بعد الضاغط مباشرة للتحكم في اتجاه جريان مائع التثليج ، حيث يكون اتجاه جريان مائع التثليج اما باتجاه خزان الماء الحار (كما في النظام الهجين) أوباتجاه المكثف مباشرة (كما في النظام التقليدي). تم جمع معاملات الأداء بواسطة مسجل البيانات، وتم عرضها وتسجيلها في جهاز الحاسوب باستخدام برنامجLabView. أظهرت النتائج أن متوسط معامل أداء النظام الهجين (R=1) كان يتراوح ما بين 2.42 الى 2.77 ، وكان متوسط استهلاك الطاقة الكهربائية ما بين 1.1 إلى 1.12 كيلوواط عندما كانت درجة حرارة الهواء الخارجي ما بين 34.2 إلى 39.7 درجة مئوية، في حين أن متوسط معامل أداء النظام التقليدي(R=0)كان حوالي 3.23 ومتوسط استهلاك الطاقة الكهربائية حوالي 1 كيلوواط عندما كانت درجة حرارة الهواء الخارجي ما بين 30.8 إلى 34.3 درجة مئوية، لذلك فان استخدام النظام الهجين في العراق بشكله الحالي قد لا يوفر طاقة كهربائية. hybrid system --- evacuated tubes collector --- vapor compression cycle. --- النظام الهجين، مجمع شمسي ذو انابيب مفرغة، دورة البخار الانضغاطية. Copper, and its, alloys and composites (being the matrix), are broadly used in the electronic as well as bearing materials due to the excellent thermal and electrical conductivities it has. In this study, powder metallurgy technique was used for the production of copper graphite composite with three volume perc ent of graphite. Processing parameters selected is (900) °C sintering temperature and (90) minutes holding time for samples that were heated in an inert atmosphere (argon gas). Wear test results showed a pronounced improvement in wear resistance as the percent of graphite increased which acts as solid lubricant (where wear rate was decreased by about 88% as compared with pure Cu). Microhardness and compressive strength increased (about 8% and 16%, for each of them) and reached to the maximum values at 1% graphite percentage as compared with pure Cu, then it decreased after that critical graphite concentration. Microstructure test indicated that the dark region in the copper matrix was increased as the percent of graphite increased and the reinforcement particles were homogeneously distributed which means that the powder metallurgy technique is suitable for such task.النحاس وسبائكه ومركباته يستخدم بشكل واسع في المواد الالكترونية والمحامل الميكانيكية وذلك بسبب قابيلة التوصيل الحراري والكهربائي التي يتمتع بها. في هذه الدراسة تم استخدام تقنية تكنولوجيا المساحيق لانتاج النحاس المتراكب المدعم بحبيبات الكرافيت. تم اختيار ظروف التشغيل وتمثلت بدرجة حرارة التلبيد حوالي 900 درجة مئوية مع زمن ابقاء حوالي 90 دقيقة داخل فرن كهربائي وسط حيز خامل مفرغ من الهواء (بوجود غاز الاركون). اظهرت نتائج الفحص تحسن ملحوض في خاصية مقاومة البلى بزيادة نسبة حبيبات الكرافيت التي عملت كمادة مزيتة (حيث انخفض معدل البلى بنسبة بلغت 88% مقارنة بالمادة الاساس). اضافة الى تحسن في قيمة الصلادة ومقاومة الانضغاط (حيث حصلت زيادة بنسبة 8% و 16% لكل منهم مقارنة بالمادة الاساس) ووصلت لاعلى قيمة عند نسبة اضافة 1% من الكرافيت، بعد ذلك انخفضت هذه الخواص عند زيادة النسبة عن الحد الحرج. كما اشرت نتائج فحص البنية المجهرية ظهور مناطق غامقة في المادة المتراكبة الناتجة تزداد بزيادة نسبة الكرافيت، وقد ظهر واضحا التوزيع الحبيبي المتجانس للمادة الناتجة بشكل يعكس ملائمة استخدام تقنية تكنولجيا المساحيق في انتاج المادة اعلاه. Magnetic nanoparticles (MNPs) of iron oxide (Fe3O4) represent the most promising materials in many applications. MNPs have been synthesized by co-precipitation of ferric and ferrous ions in alkaline solution. Two methods of synthesis were conducted with different parameters, such as temperature (25 and 80 ̊C), adding a base to the reactants and the opposite process, and using nitrogen as an inert gas. The product of the first method (MNPs-1) and the second method (MNPs-2) were characterized by x-ray diffractometer (XRD), Zeta Potential, atomic force microscope (AFM) and scanning electron microscope (SEM). AFM results showed convergent particle size of (MNPs-1) and (MNPs-2) with (86.01) and (74.14) nm respectively. Also, the zeta potential values of (MNPs-1) and (MNPs-2) were (2.77) and (-12.48) mV, respectively, which indicates more stability of (MNP-2). الدقائق النانوية المغناطيسية (MNPs) لأوكسيد الحديد (Fe3O4) تمثل أكثر المواد الواعدة في العديد من التطبيقات. تم تصنيع الدقائق النانوية المغناطيسية بطريقة الترسيب المشترك لأيونات الحديديك والحديدوز في محلول قلوي. تم إتباع طريقتين للتصنيع وبعوامل مختلفة، مثل الحرارة (25 و 80 ̊م)، إضافة القاعدة الى المواد المتفاعلة والعملية العكسية لها، و إستخدام النتروجين كغاز خامل. تم تشخيص ناتج الطريقة الأولى (MNPs-1) والطريقة الثانية (MNPs-2) بواسطة جهاز حيود الأشعة السينية (XRD) وجهد زيتا ومجهر القوى الذرية (AFM) والمجهر الألكتروني الماسح (SEM). نتائج فحص AFM بينت تقارب في حجم دقائق (MNPs-1) و (MNPs-2) بقيمة (86,01) و (74,14) نانومتر، على التوالي. كذلك قيم جهد زيتا لـ (MNPs-1) و(MNPs-2) كانت (2,77) و(- 12,48) ملي فولت، على التوالي، والذي يعد مؤشراً على أن (MNPs-2) أكثر استقراراً من (MNPs-1). magnetic nanoparticles --- iron oxide --- co-precipitation. --- دقائق نانوية مغناطيسية ، أوكسيد الحديد، الترسيب المشترك. Due to wind wave actions, ships impacts, high-speed vehicles and others resources of loading, structures such as high buildings rise bridge and electric transmission towers undergo significant coupled moment loads. In this study, the effect of increasing the value of coupled moment and increasing the rigidity of raft footing on the horizontal deflection by using 3-D finite element using ABAQUS program. The results showed that the increasing the coupled moment value leads to an increase in lateral deflection and increase in the rotational angle (α◦). The rotational angle increases from (0.014, 0.15 to 0.19) at coupled moment (120 kN.m), (0.29, 0.31 and 0.49) at coupled moment (240 kN.m) and (0.57, 0.63 and 1.03) at coupled moment (480 kN.m) with decreasing the raft thickness from (1.5, 1.0 to 0.5m), respectively. The computed maximum lateral deflection decreases with increasing the rigidity of raft. The maximum deflection decreases from (40 to 3mm) at coupled moment 120 kN.m, (150 to 60mm) at coupled moment 240 kN.m and (210 to 118mm) at coupled moment 480 kN.m with increase raft thickness from (t = 0.5 to 1.5m) and the maximum reduction in maximum stress value and lateral deflection mobilized due to applied coupled moment is noticed when width to thickness of footing ratio is less than (w/t<12). The failure of the footing is noticed when the rotational angle is more than 4◦ (α > 4◦)نتيجة للاحمال الناتجة من تاثير الريح والسفن والسرعة الفائقة للمركبات احمال اخرى ذات مصادر مختلفة فان المنشاءات متعددة الطوابق والجسور وابراج نقل الطاقة الكهربائية تكون تحت تاثير العزم المزدوج. البحث ياخد بنظر الاعتبار تاثيروقيمة العزم المزدوج والجساءة للاساس الحصيري وتاثيرهما على الاود الجانبي للاساس باستخدام العناصر المحددة المتاحة في برنامج (ABAQUS). النتائج تظهر ان زيادة العزم المزدوج يؤدي الى زيادة الاود الجانبي للاساس الحصيري وزيادة في زاوية الدوران الاساس (α◦). ان زاوية الدوران تزداد من 0.14) الى 0.19) عندما العزم المزدوج (120 kN.m), 0.29)الى 0.49) عندما العزم المزدوج (240 kN.m) ومن (0.57 الى 1.03)عندما العزم المزدوج (480 kN.m) بتقليل سمك الاساس من1.5) الى 0.5)على التوالي. وان الاود الجانبي لاساس يقل بزيادة جسائة الاساس برغم من زيادة قيمة العزم المزدوج حيث تقل من 40) الى 3 ملم) عند العزم المزدوج (120 kN.m), 150) الى 60 ملم) عند العزم المزدوج 240kN.m)) و 210) الى 118 ملم) عندالعزم المزدوج (480 kN.m) مع زيادة سمك الاساس من 0.5 الى 1.5 على التوالي. عندما تكون نسبة عرض الاساس الى سمكه اكبر من 12 نلاحظ اعظم نقصان بالاود الجانبي للاساس والاجهادات المتولدة نتيجة لتاثير العزم المزدوج. ان حالة فشل الاساس تظهر عندما تكون زاوية الدوران اكبر من ◦4. The effect of using grinded rocks of (quartzite and porcelanite) as powder of (10 and 20) % replacement by weight of cement for self-compacting concrete slabs was investigated in this study. Five slabs with 15 concrete cubes were tested experimentally at 28 days to study the compressive strength, ultimate load, ultimate deflection, ductility, crack load and steel strain. The test results show that, the compressive strength improvement when replacement of local rock powder reached to (7.3, 4.22) % for (10 and 20) % quartzite powder and (11.3, 16.1) % for (10 and 20) % porcelanite powder, respectively compared to the reference specimen. The ultimate load percentage increase for slabs with (10 and 20) % replacement of quartzite powder was 41.17% and 23.53%, while the slabs with (10 and 20) % replacement of porcelanite powder were 23.53% and 35.3% compared to the reference slab, respectively. The ultimate deflection, ductility, spread cracks and ultimate steel strain for slabs with replacement materials (quartzite and porcelanite) increased significantly compared to the reference slab. في هذه الدراسة تم بحث تأثير استخدام مطحون صخور الكوارتزايت والبورسلنايت بنسب استبدال (10 و20)% من وزن السمنت لخرسانة ذاتية الرص. تم فحص 5 سقوف و15 مكعب بعمر 28 يوم مختبرياً لدراسة مقاومة الانضغاط و حمل التشقق والحمل الاقصى والهطول الاقصى والليونة والانفعال في الحديد. نتائج الفحص بينت ان هناك تحسن في مقاومة الانضغاط عند اضافة مطحون الصخور المحلية تصل االى (7,3و4,22)% لنسب الاستبدال (10و20)%من الكوارتزايت و (11,3و16,1)% لنسب الاستبدال (10و20)%من البورسلينات على التوالي عند مقارنتها مع المرجعية. نسبة الزيادة في الحمل الاقصى للسقوف التي تحوي نسب استبدال (10 و20)%من مطحون الكوارتزايت كانت (41,17 و 23,53)%، بينما السقوف التي تحوي نسب استبدال (10و20)% من مطحون البورسلينايت كانت (23,53% و 35,3) عند مقارنتها مع سقف المرجعية, وعلى التوالي. الهطول الاقصى والليونة وانتشار الشقوق والانفعال الاقصى للحديد للسقوف المحتوية على المواد المستبدلة (كوارتزايت وبورسلينايت) زادت عند مقارنتها مع سقف المرجعية. porcelanite powder --- quartzite powder --- self-compacting concrete --- ultimate load --- and deflection. --- مطحون الكوارتزايت، خرسانة ذاتية الرص البورسلينايت، مطحون --- الحمل الاقصى والهطول. Global Navigation Satellite System (GNSS) is considered to be one of the most crucial tools for different applications, i.e. transportation, geographic information systems, mobile satellite communications, and others. Without a doubt, the GNSS has been widely employed for different scientific applications, such as land surveying, mapping, and precise monitoring for huge structures, etc. Thus, an intense competitive has appeared between companies which produce geodetic GNSS hardware devices to meet all the requirements of GNSS communities. This study aims to assess the performance of different GNSS receivers to provide reliable positions. In this study, three different receivers, which are produced by different manufacturers, were fixed to form a triangle. Simultaneous observations were made in static mode (2.5 to 3 hours). This observation technique was carried out three times by changing the location of receivers in each time to ensure that three receivers observed each station three times. To evaluate the performance of each receiver, OPUS web-based processing software and TOPCON TOOLS were used to process the raw GNSS observations. The distances between adjacent stations were computed for each observation and compared to standard distances, which were measured using a total station. Furthermore, the internal angles were also computed and compared to those measured by Total Stations. The results showed that some calculated distances are closer to the corresponding distances measured by the total station. This indicates that the receivers involved in the composition of these distances are the most accurate.يعد النظام الملاحي العالمي من الانظمة المهمة في العديد من التطبيقات الجيودسية الواسعة والمختلفة، فقد استخدم في مجالات تحديد مواقع ووسائل النقل المختلفة مثل السيارات والطائرات والسفن. ومن ناحية اخرى يستخدم في العديد من التطبيقات العملية والعلمية كأنتاج الخرائط والمسح الارضي والرصد المستمر للإنشاءات الضخمة. لقد تنافست مؤسسات وشركات ضخمة في انتاج المتسلمات التي تستخدم النظام الملاحي العالمي لمعرفة وتحديد المواقع والاحداثيات الارضية. الا ان السؤال المطروح الان هو كيف يتم التأكد من ان هذه المواقع او الاحداثيات التي تزودنا بها تلك المتسلمات بمختلف انواعها هي احداثيات دقيقة وغير مخطوءة ؟ وهذا ما سيتم ايضاحه قي هذه الدراسة. حيث استخدمت ثلاث متسلمات مختلفة النوع ومن منشئين مختلفين لرصد ثلاث نقاط (تكون على شكل مثلث) في نفس الوقت بطريقة الرصد الثابت وبفترة زمنية للرصد تتراوح بين ساعتين ونصف الى ثلاث ساعات. تم اتباع اسلوب معين للرصد مبني على اساس التبادل بين مواقع المتسلمات في كل عملية رصد لكي يتم رصد كل نقطة بثلاث متسلمات من خلال ثلاث مجاميع للرصد. وللحصول على دقة عالية تتراوح من 3-5 ملم تم اجراء عمليات التصحيح على النقاط المرصودة بإرسالها الى موقع معين على الشبكة العنكبوتية (OPUS) اضافة الى تصحيح خط القاعدة الاساس باستخدام برنامج (TOPCON TOOLS). وبعدها يتم استخراج المسافات بين تلك النقاط في كل عملية رصد وهي تمثل اطوال اضلاع المثلث. ومن ثم قياس المسافات بين النقاط الثلاث (التي تمثل اطوال اضلاع المثلث) بأسلوب اخر عن طريق استخدام جهاز المحطة المتكاملة واجراء عملية التحقق من هذه المسافات عن طريق حساب الزوايا الداخلية للمثلث بقانون (COSINE). اظهرت النتائج ان المسافات المحسوبة بالأسلوب الاول تتباعد وتتقارب من المسافات المقيسة بالأسلوب الثاني وبعد تحليل النتائج نستنتج ان المسافات التي تتقارب تكون متأتية دائما من نفس المتسلمات وهي الادق.